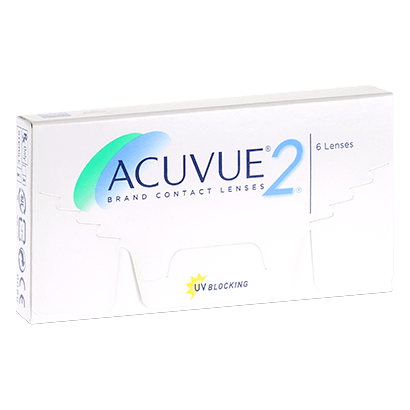 Part of the best-selling Acuvue range, Acuvue 2 contact lenses is an impressive two weekly contact lens that provides you with the freedom to wear your lenses the way you wish. 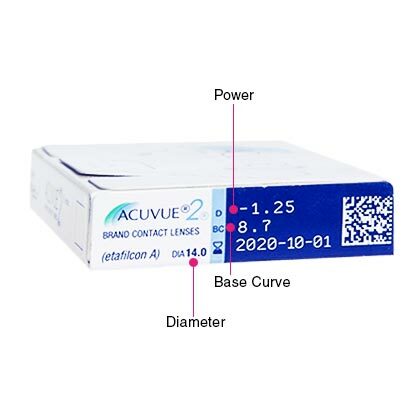 Acuvue 2 contacts boast a soft and flexible hydrogel design. Coupled with a 58% water content, wearers can enjoy a comfortable lens all day long. Created by Johnson & Johnson, these two weekly contacts are highly breathable, keeping eyes feeling fresher and healthier for longer. In addition, these quality contact lenses are also easy to apply, thanks to the implementation of a 1,2,3 indicator and blue handling tint. As two weekly contact lenses, Acuvue 2 contacts are designed for daily wear and nightly removal for up to two weeks, during which time you’ll need to clean and store your lenses in contact lens solution overnight. We recommend our best-selling comfi All-in-One Solution. Alternatively, however, these lenses provide the freedom of extended wear, should this be approved by your optician. This means that you’ll be able to wear each set of lenses day and night for up to a week, without needing to remove them before bed. Highly comfortable and convenient to use, these contact lenses are just another example of the quality you’ve come to expect from the Acuvue range. Acuvue Oasys can alternatively be worn as an upgrade, offering HydraClear Plus technology. Always excellent service and great product. For me they are the most comfortable lenses I have ever worn. The product it’s great, I’ve been using this contact for years and I will keep doing it, because I get fabulous results. Excellent lenses for dry eyes sufferers. I used to wear dailies and specsavers brand but wasn''t very happy as my eyes felt sore after a couple of hours wear so decided to shop around. Came across acuvue 2 reviews online and decided to give them a go and see what the praise is all about and wasnt disappointed. Great quality lenses and value for money if you switch from dailies. If you care about them properly (I recommend a peroxide preservative-free system) and not wear them long hours or every day they can last for longer than 2 weeks. Cheap and good product, my eyes are very confortable with them for up to 10 hours. You can use them on everyday for 15 days (and more) with no problems at all. Great product. Used for many many years. Excellent. This is the most comfortable lens, it is great. The product is exactly as I expected. Very good lenses. These lenses are the best for comfort. I have tried a few others but they make my eyes dry. Acuvue is a good make. Constant top quality and very quick delivery. Those contact lenses are very comfortable to wear. good product, description is accurate. 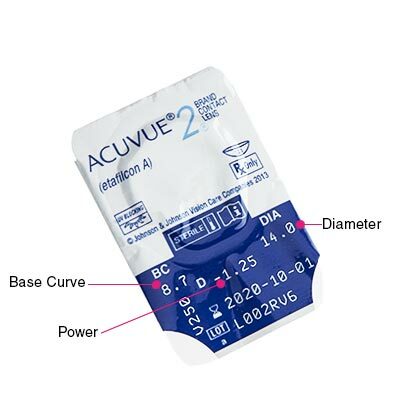 I gather that Acuvue 2 are not the most up to date lenses. However, I have been using them for many years and, although I have tried others, as suggested by opticians, they are still the most comfortable ones for me. I''ve been using these contacts for years and can''t recommend them more highly. I found these very uncomfortable and blurry in near vision. 10 years of using these lenses they give me no problems at all. Flexible, very soft, and so comfortable. Much better than the toric lenses that my optician was pushing me to buy that were unnecessary. I hope J&J continue the Acuvue 2''s. Most comfortable contact lenses I have used. I like this product, have been using it for all my myopic life which is at least 20 years. Very comfortable and easy to use. I like the 2 weekly lenses as they are comfortable and don''t get worn out unlike some monthly lenses. Very good service, always on time and reliable. No stress or bother lenses arrive in perfect condition. Would recommend to all contact lense users.